After an extended time in captivity, prisoners can form relationships with their jailers. 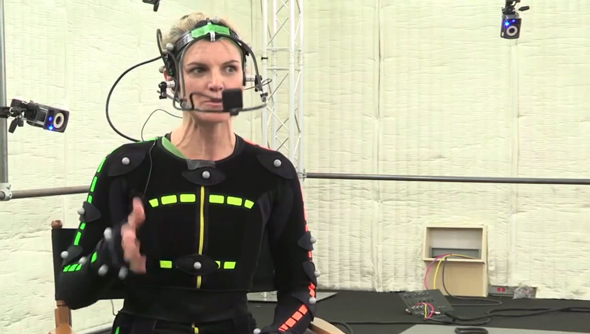 That’s only what I can assume has happened in the case of this poor woman: Kate Drummond, the actor for Splinter Cell Blacklist’s Anna Grim, Fourth Echelon’s analyst, has clearly been caged in some form of sensory deprivation suit before being interrogated about her character; yet, she couldn’t seem happier to be in this situation. It shows something of Ubisoft’s balls that they’re willing to release footage showing the inhumane manner they keep their actors. Green-walled halls lined with bright lights and cameras to leave them in a state of confusion and staged interviews in which they are interrogated by, not, as you would expect, members of the press, but a ubisoft employee/guard. We must do what we can to raise awareness of the plight of Drummond and others like her.